Dr. Joseph Mercola is a board-certified physician with over 20 years' experience treating over 20,000 patients. He shares his knowledge through his website, Mercola.com, which is one of the most visited health sites in the world. For more health news, follow Dr. Mercola on Facebook, Twitter, and YouTube. You can also find him on LinkedIn and Pinterest. When an important nonfiction book hits the New York Timesbestseller list, an amazing thing happens -- no matter what the book's topic, the mainstream media is required to report on it. This means that the book's subject is then very widely exposed to both the general public and politicians as well ... whether the mainstream media, the politicians and big business like it or not. As I think you'll agree, books don't get much more important than The Great Bird Flu Hoax, my major new release that I have poured an extensive amount of time into along with my co-author and team. And I can assure you that -- because of the great hoax this book exposes and the extremely crucial truths it provides you that have a profound impact on your health -- this is one book that certain politicians and big businesses will wish NEVER hit the New York Times bestseller list! The U.S. government is warning that a new avian super-flu could kill nearly two million Americans -- or if we're "lucky" just 200,000. Mainstream media is parroting the paranoia, routinely spotlighting the relative few deaths attributed to the virus elsewhere in the world while staying calm to silent about the 2.8 million deaths yearly from AIDS worldwide and the 300,000 deaths yearly in the U.S. alone from obesity. with everything from bird flu masks and respirators to guides on how to survive the coming plague being hawked to a terrified public. But there is no coming bird flu pandemic. 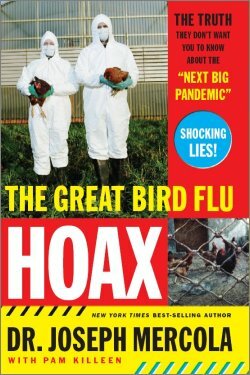 It is a big lie being fed by the government and big business for reasons that ironically pose a much more serious threat to your health ... reasons you will learn all about in my new book The Great Bird Flu Hoax that is available for a special 32% off price. A government that is more than just complicit ... working with the drug companies and other stalwarts of the conventional healthcare paradigm, they are directly responsible for raising false alarms in order to draw your attention AWAY from the real public health and safety issues they are PERPETUATING. For example, you will learn how, in preparation for the supposed coming bird flu plague, the government purchased $2 billion worth of Tamiflu (a drug whose effectiveness in relation to H5N1 is questionable) ... and how Donald Rumsfeld -- once president of the company that developed Tamiflu -- stands to benefit BIG-TIME from this "coincidence." The most important and effective steps to optimize your immune system ... so you need not worry about bird flu or any other type of hype, or about the real health threats such as cancer, heart disease and other genuine health issues, for that matter. What Else Don't They Want You to Know About? Could the Bird Flu Be a Blessing in Disguise? Just imagine how much your health will improve once you finally know the TRUTH! By the way, any profit off this book will as always go right back into continually improving Mercola.com and expanding its mission of transforming our current healthcare paradigm to one focused on real prevention and cure. Discover how one of main causes of bird flu disease is also one of the primary beneficiaries. Learn the astounding role that 50 million of pounds of chicken manure has played in the "bird flu"
One simple choice you can make that would radically reduce the spread of all food-borne illnesses. What would you do with a billion dollars? Find out how many billions the government will waste on ineffective "solutions" for the nonexistent bird flu. Just how extensively will U.S. pharmaceutical giant Roche benefit from the government to stockpile worthless drugs for this imaginary epidemic?